Located in the lush Tropical jungle, Free Taxi ride, full Brazilian Breakfast, pool table, communal kitchen and the chance to swim in the resort’s natural river pools. Relax in the middle of peaceful Brazilian Nature and River waterfalls. Relax in the middle of peaceful Brazilian Nature, surrounded by Lush gardens, Tropical forests and refreshing River waterfalls. Chill Inn Eco-Suites Paraty offers cozy accommodation and the opportunity to enjoy wild nature and swim in the resort’s beautiful river, away from the crowds, yet only a few minutes away from Paraty’s Historical Center. When was the last time you laid in a Hammock to Relax, Sleep, or read while listening to pure sounds of Nature? 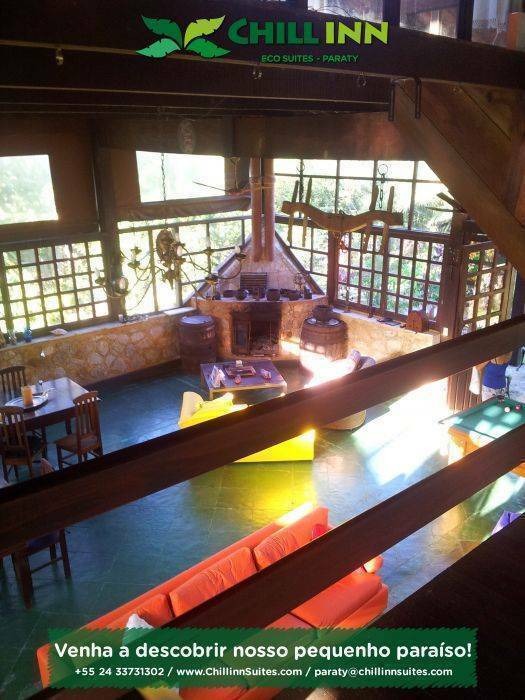 Our Bed & Breakfast is located in the lush Tropical jungle just a 10 minute drive from downtown Paraty. We offer a Free Taxi ride, full Brazilian Breakfast in our spacious chill-out Lounge, pool table, communal kitchen, bbq, and the chance to swim in the resort’s natural river pools of crystal clear water. Eco-Suites in Paraty. Accommodation with en-suite bathrooms in our rustic chalets for up to 6 guests. Ideal for groups of friends, solo travellers, couple’s romantic retreats, or families with kids. 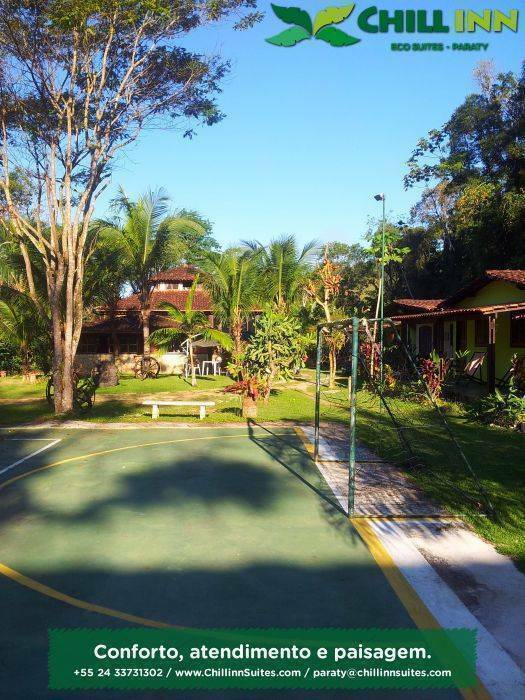 Located in the lush Tropical jungle, Free Taxi ride, full Brazilian Breakfast, pool table, communal kitchen and the chance to swim in the resort’s natural river pools. 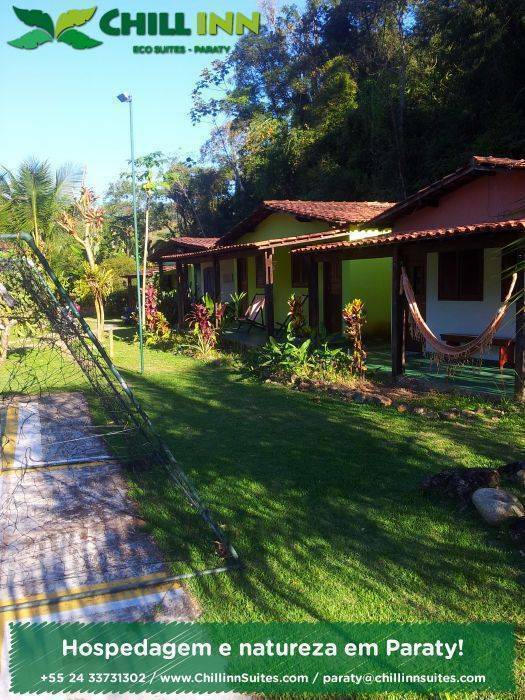 Relax in the middle of peaceful Brazilian Nature and River waterfalls. 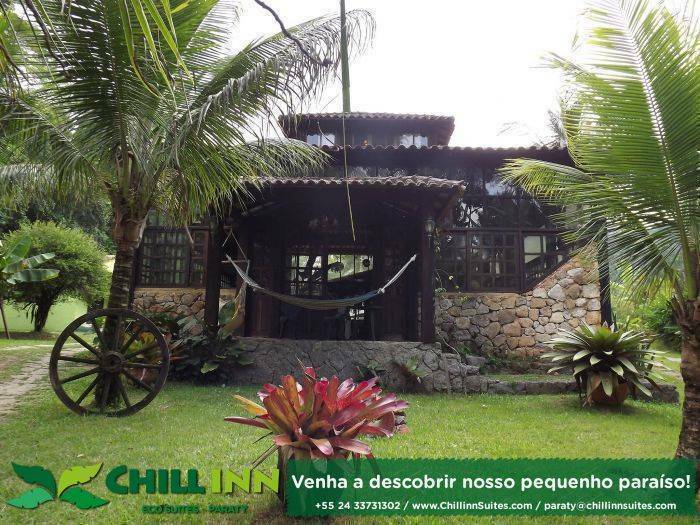 Chill Inn Eco-Suites Paraty, cozy accommodation only a few minutes away from Paraty’s Historical Center. We offer a Free Taxi ride, full Brazilian Breakfast in our spacious chill-out Lounge, pool table, communal kitchen, bbq, and the chance to swim in the resort’s natural river pools of crystal clear water. Private Single / Twin / Double - Ensuite, Fridge, Gardenview free breakfast. Private Triple - Ensuite, Fridge, Gardenview free breakfast. Private Quad - Ensuite, Fridge, Gardenview free breakfast. 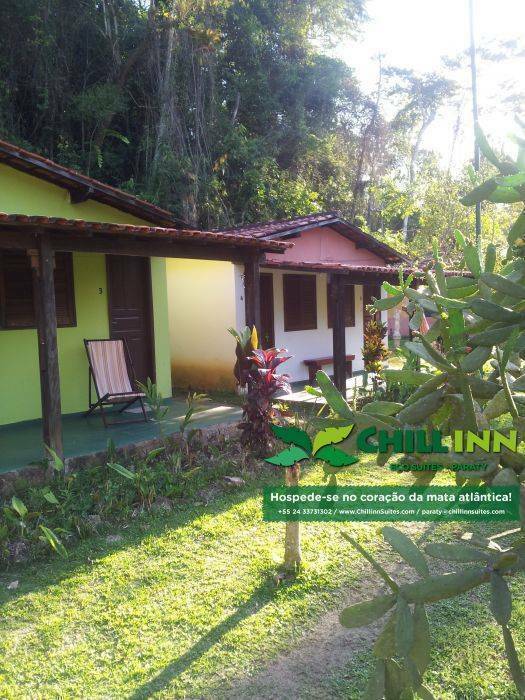 Chill Inn Eco-Suites Paraty is located in the very heart of the Tropical jungle just a 10 minute drive from downtown Paraty. We require payment on arrival. Please note that the actual total will be calculated by Chill Inn Eco-Suites in its local currency, based on the currency exchange rate (if applicable) in effect at the time charging occurs. 50% deposit is required to confirm and guarantee your reservation; the remainder is due on arrival at Chill Inn Eco-Suites. Deposits are non-refundable for cancellations made 72 hours or less in advanced of your scheduled arrival time. It will remain under the guesthouse discretion to refund deposits for booking changes made within the 72 hours period prior to arrival. For changes on bookings after arrival, the subsequent period of 72 hours will not be refunded. In the case of no shows, deposits will not be refunded and the full amount for the transfer will be charged to the customer. Please note that any cancellations must be notified directly to Chill Inn Eco-Suites at least 72 hours in advance of your scheduled arrival time. * We require 50% to be paid in advance. If you book through a booking engine (ie. 10% deposit) the difference to complete the 50% should be paid directly to Chill Inn Eco-Suites. Cancellations can be made before November 30th with a 100% refund of the total amount. After that date the amount that has been already paid will not be refunded. Cancellations can be made before December, 31st with a 100% refund of the total amount. After that date the amount that has been already paid will not be refunded. Even if the booking engine allows you to book less nights at the normal rate, for the Carnival and New Year's Packages, your booking will not be valid if you do not book the whole package. Bookings for New Year or Carnival must be for the whole period of the package, any booking that breaks into the New Year's or Carnival dates will be automatically canceled and the deposit amount not refunded. You will be immediately contacted about the payment from the whole package. 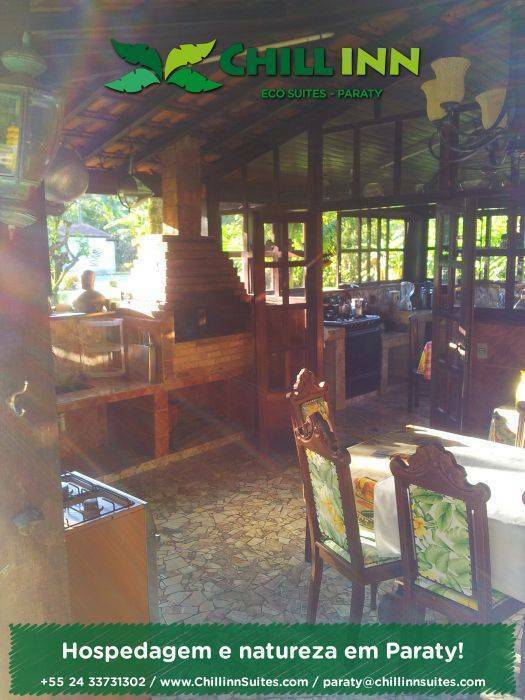 Chill Inn Eco-Suites offers you a free pick up upon your arrival in Paraty from the bus station to our location. This service is offered for free to our guests staying a minimum of 3 nights (or equivalent booking to R$100/US $60) and that have already confirmed the booking using one of our payment methods. Please note that in case of delays, it is the passenger responsibility to inform Chill Inn Eco-Suites about the new arrival time. In case the passenger has not informed our staff about the delay, Chill Inn Eco-Suites will not be responsible for the transfer charge. The passenger will be held responsible for the total amount of the transfer in. If the passenger did not arrive at all, then the full cost of the transfer will be charged to the customer. This free transfer service is offered between 9.00 am to 10.00 pm. For reservations guaranteed with a 50% deposit or more at time of booking, rooms are held until check-out time the day following arrival. In the event more guests arrive than can be accommodated due to overbooking or an unforeseen circumstance, and the guesthouse is unable to hold rooms consistent with booking room hold policy, the guesthouse will attempt to accommodate guests, at its expense, at a comparable hostel in the area for the oversold night(s), and will pay for transportation to that hostel. In our strive to improve and upgrade our facilities to satisfy all our guest, Chill Inn Eco-Suites sometimes undergoes refurbishment work in some parts of the guesthouse. We do our best to ensure guests will not be affected by the renovations but please beware of the latter possibility. Just before you arrive to Paraty you will get to the Roundabout with exits to Paraty, Rio de Janeiro, São Paulo and Cunha. Take exit to Cunha (from São Paulo go left at the roundabout; from Rio turn right).